You can put all e-learning courses into one of two categories – synchronous e-learning and asynchronous e-learning. The technology used for both is typically the same, with differences coming in course structure and learning approach. This shows the flexibility you have when delivering training using e-learning methods. In fact, one of the reasons e-learning is so effective is that almost anything is possible. When I visit a client, I can ask them what they want to achieve and how they would like to achieve it, knowing it can be done. This is why e-learning is changing education from children in primary school right through to adults acquiring new skills. If you think your team will learn more effectively with the direct involvement of a trainer but you still want to cut the cost of training, synchronous e-learning is an option. If you want to maximise the financial benefits of e-learning while also using a method of training that gets impressive results, asynchronous e-learning is the method you should choose. Synchronous e-learning is similar to classroom-based learning in that there is a teacher or trainer plus multiple learners. Synchronous e-learning, therefore, has a set schedule. The learners can interact in real-time with both the trainer and with their fellow learners, but the classroom is virtual. This means learners can be anywhere in the world – all they need is a suitable device and an internet connection. The interactions, including instructions from the trainer, take place via videoconferencing, instant messaging, virtual whiteboards, screen sharing, and more. Cost-effective – synchronous e-learning costs less than traditional classroom learning as there are no travel or accommodation costs. Participants also don’t have to take time out of their schedules to travel. Engagement – some learners respond better when there is real-time engagement, plus it can also help with learner motivation. Instant response – following on from the last point, learners get instant responses to questions and queries so the issue is dealt with while it is still fresh in their minds. Enhanced collaboration – sometimes, collaborative tasks can help learners get a better understanding of a skill or concept. These types of task are possible in synchronous e-learning courses. More personal – some learners enjoy the experience of learning with others rather than on their own. Familiar – learners are not physically in a classroom together but the result with synchronous e-learning is similar. This familiarity is sometimes welcomed by learners. Asynchronous e-learning is learning with no live element. Instead, learners proceed through courses at a time and pace that suits them. It is the most common type of e-learning model used in businesses today. As the learner doesn’t have to be at a computer at a fixed time it is a more flexible form of learning. There is still the possibility of adding interactive elements so individuals can communicate with trainers and fellow learners, but this does not happen in real-time. Low cost – asynchronous e-learning is even cheaper to run than synchronous e-learning as there is no need for a trainer to be present. Flexible – learners can go through the course at a time that suits them. Depending on the method of delivery, learners might also be able to choose where they continue their learning. Adaptable – learners can also proceed through course topics at a pace that suits them. This is much more difficult with synchronous e-learning where all learners have to proceed at more or less the same pace. More time – it is also easier with asynchronous e-learning for learners to reflect on and digest the material, and to go over some of the content again. More efficient – providing the course has good structure and design, it is possible to achieve impressive results with e-learning. Making courses flexible, empowering the learner to take charge of their own development, and using modern technical and educational tools, all result in better learning outcomes. 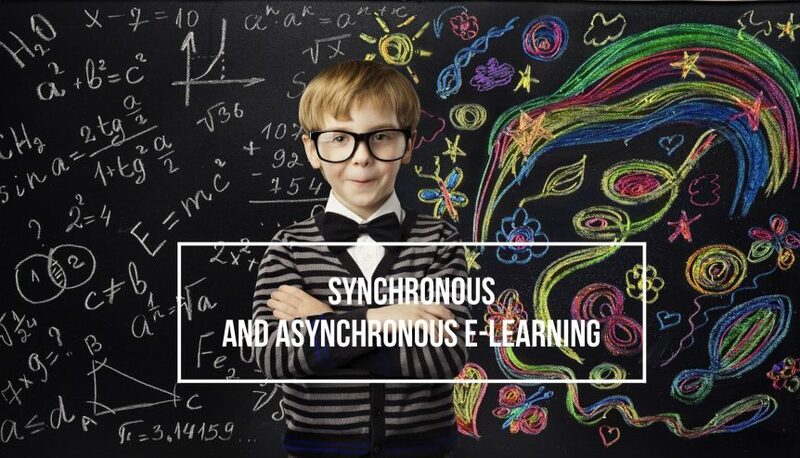 One final point to mention is that some e-learning courses have both synchronous and asynchronous elements. For example, a course delivered primarily through an asynchronous model but with trainer-led sessions to cover specific topics. Which option is right for your course depends on what you want to achieve and the subjects being covered.